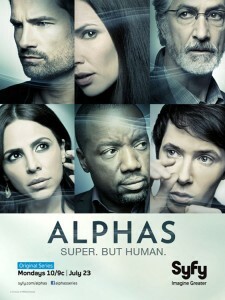 SyFy has a some amazing quality programming on their hands, and one of the shining stars thus far is Alphas. Season 1 followed the main characters’ journey from squabbling individuals to a working group of super humans staying hidden in plain sight. There are still flaws and mysteries for them to work out, but the battle to be the alpha Alpha has been overshadowed by greater challenges. Season 1 ended with Dr. Rosen’s public revelation of Alphas existence and Season 2 will explore the ramifications of his actions, not just on the team but on government and society. The scripting has been terse and explosive so far, and the show was an immediate hit for SyFy, becoming the most-watched original series on the channel. Season Two will bring in amazing guest stars such as C. Thomas Howell, Lauren Holly, Summer Glau, and Sean Astin. Original drama well crafted on SyFy is truly something to enjoy. Don’t miss this.